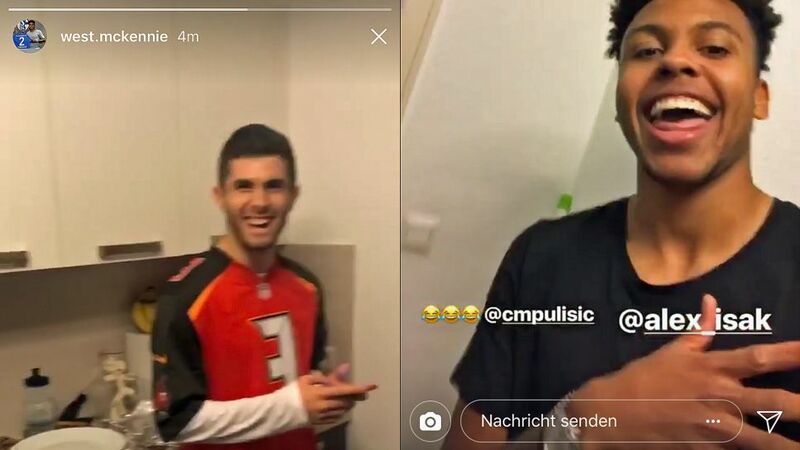 They will be on opposite sides of the pitch in the Revierderby on Saturday when Borussia Dortmund host Schalke, but USA starlets Christian Pulisic and Weston McKennie put their club rivalry to one side on Thursday to share a traditional American Thanksgiving meal, alongside teenage BVB striker Alexsander Isak. McKennie, who has nine Bundesliga appearances to his name and recently scored on his full debut for the USMNT, posted a short clip of the gathering on his Instagram story. "The best thing about Thanksgiving…" the 19-year-old Texan says while zooming in on a table full of food, "…is family of course!" His comment prompts laughter from Pulisic, whose parents joined him in Germany to celebrate the occasion. In a separate video on Dortmund's YouTube channel, the 19-year-old outlines why Thanksgiving is so important to him. "Thanksgiving is one of my favourite holidays," he says. "All I remember is just a long table with all my family members and eating a lot of food. Having all the family there and people yelling across. There are ten different conversations going on. That's the best part. My mum will usually cook the turkey. She does most of the work in the kitchen. She would say no but I think I'm a pretty good helper. I help out where I can. More with deserts. Every year my mum makes sweet potatoes with marshmallows and it's my absolute favourite. That's the best Thanksgiving memory." Pulisic has missed Dortmund's last two competitive matches with a muscle complaint, but is expected to be back in action this weekend as Peter Bosz's side look to beat their fierce local rivals and record their first league win since 30 September. Click here for more on the Revierderby between Dortmund and Schalke!